Dozens Killed By Shots Fired At Pro-Morsi Gathering In Cairo : The Two-Way Supporters of the ousted president had gathered outside the facility where it's believed he's being held. There are conflicting accounts of what happened. What's known for sure is many of Morsi's supporters were killed by gunshots. Hundreds more were wounded. It's feared there will be more clashes. A wounded man is helped from the scene Monday in Cairo after shots were fired during a protest against the ouster of President Mohammed Morsi. An already dangerous, volatile situation turned even deadlier early Monday in Cairo when dozens of people were killed at a protest outside the Republican Guard facility where it's believed ousted President Mohammed Morsi is being held. Most of those who died are reported to have been among a large group of Morsi's supporters. Egypt will hold parliamentary elections by February, says interim president Adly Mansour, with a presidential vote to follow. At least two police officers and one soldier were killed in Monday's violence, reports NPR's Leila Fadel from Cairo, for All Things Considered. Leila visited a sit-in organized by the Muslim Brotherhood, where she heard the same story from everyone, she says — that they were bowing their heads in prayer when the police and military opened fire. "Of course I had to run, I had to run a lot," says Ahmed Abdul Aziz, a young sales manager who was carrying the belongings of one of the dead as he spoke. "But witnesses in the area where the clashes occurred say it isn't that simple," Leila reports. "They say a crowd of Morsi supporters grew angry after their morning prayer. Some called for Jihad or holy struggle as they moved toward the building where Morsi is believed to be held. Then the tear gas began. And then the gunshots. Witnesses say they saw gunfire coming from both sides." 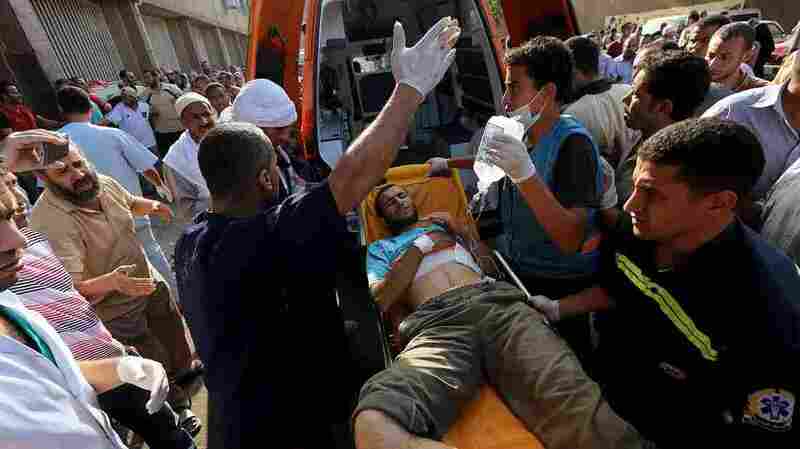 Leila also visited a makeshift Cairo medical clinic, which tended to wounded protesters. "Many were shot in the back and head with birdshot," she says. Interim president Adly Mansour called for restraint and calm Monday, saying that he has ordered the formation of a judicial committee to investigate the deaths. Monday afternoon, the White House said it is still reviewing whether to cut U.S. aid to Egypt. Reuters reports that "the death toll in violence at the Cairo headquarters of the Republican Guard on Monday rose to 51, the head of Egypt's emergency services said. The number of wounded was 435, Mohamed Sultan said." "Military spokesmen said gunmen opened fire on troops at the building. ... A spokesman from Morsi's Muslim Brotherhood, Mourad Ali, and a witness at the scene, however, said military forces opened fire at dawn on the protesters outside the Republican Guard building." The pro-Morsi gathering is being described by the AP and others as a sit-in. "Eyewitness accounts ... have inflamed the already simmering tensions. For Egyptians, it is shocking news no matter who started the gunfight. The deadly incident is not the first. On Friday, three protesters were killed at the same spot in unclear circumstances but against a backdrop of a stand-off between the army and the pro-Morsi protesters." Reuters adds that "as an immediate consequence, the ultra-conservative Islamist Nour party, which initially supported the military intervention, said it was withdrawing from stalled negotiations to form an interim government for the transition to fresh elections." From Cairo, NPR producer Greg Dixon tells us that Health Ministry officials estimate there were at least 51 people killed, and at least 400 injured (we updated these numbers with new info from Greg Monday afternoon). On Morning Edition, NPR's Soraya Sarhaddi Nelson reported from Cairo that it's feared there will be more violence later on Monday when Morsi's supporters are expected to gather for prayers and possibly some funeral processions for those who were killed earlier in the day. Protests against the year-old Morsi government grew in late June. Many Egyptians are angry over the country's deep economic problems and believe that Morsi and his Islamist Brotherhood party have not responded to the needs of most people. Last Wednesday, Egypt's military removed Morsi from office. An interim president, Adly Mansour, is now trying to form a temporary government. The military has promised there will be new elections. Morsi is Egypt's first democratically elected leader.